Welcome to the Lodi Wine & Visitor Center – one of California’s most exciting wine country destinations. The Visitor Center features an expansive tasting bar featuring a wide selection of regional wines, educational demonstration vineyard on grape growing and a gift shop featuring handcrafted products and Lodi giftware. 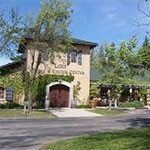 The Wine & Visitor Center is a great introduction to the delicious wines of the Lodi Appellation. Expert staff will lead guests through a guided tasting of some of the region’s finest wines. The Visitor Center features hundreds of Lodi wines from the nearly 80 local vintners offering guests a truly unique experience. Eight wines are served on a daily basis, and the wines are rotated weekly. Situated on the picturesque grounds of the Wine & Roses Hotel, Restaurant, & Spa the Wine & Visitor Center offers a great introduction to the wonderful wines of Lodi. Just 35 minutes south of Sacramento and 90 minutes east of San Francisco – the Lodi Wine & Visitor Center is a must stop sight in the Northern California wine country. Tasting Fee: $8.00. Includes a flight of 4 wines.